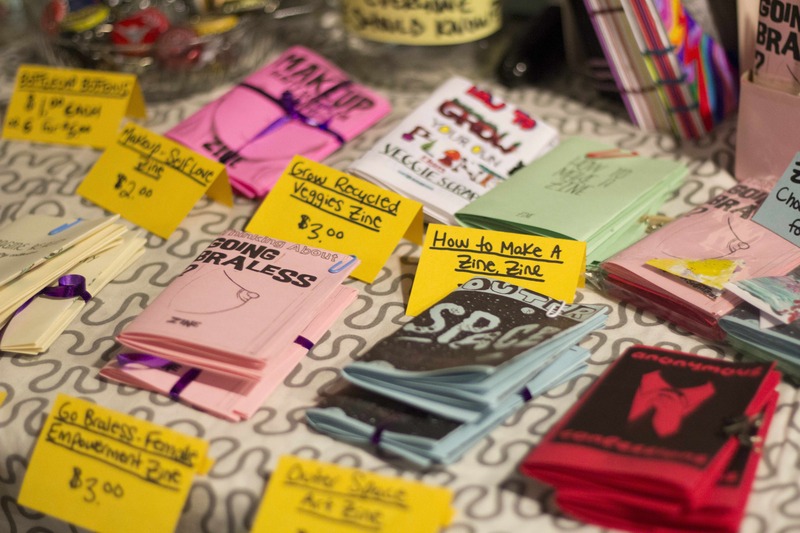 The works of the speakers and vendors at Canzine — Vancouver’s Festival of Zines and Underground Culture — exist on a spectrum between things you might find on the shelf of Chapters to things so niche that the artists themselves may find it difficult to describe. 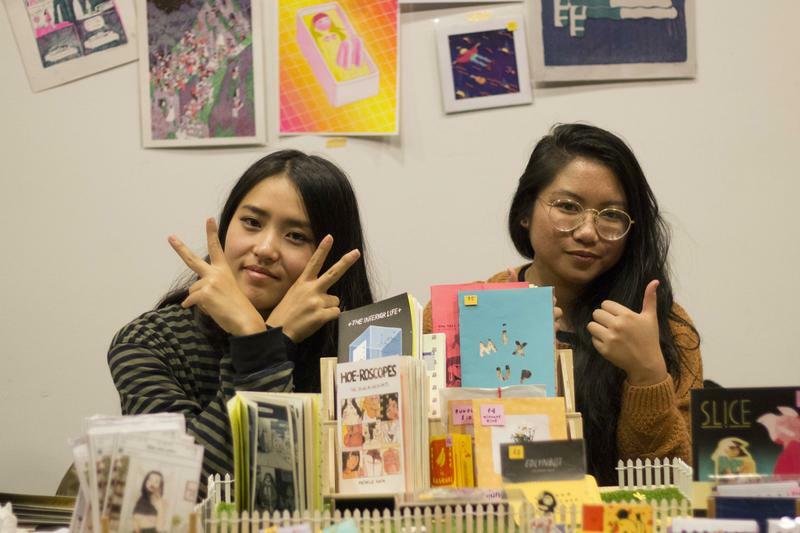 From doodles of puppies, to hand-pressed calligraphy anthologies, to guides on incorporating painting into the occult, there was a something for everyone at Canzine. “That’s why I love zine culture — there is no balance,” explained Isabelle Guns, a Canzine volunteer who has seen the Vancouver zine scene explode during her 30 years of involvement. With this year being Canzine Vancouver’s biggest yet, featuring two panels and over 100 vendors, it’s hard not to believe her. What classifies as being a part of the zine and underground culture community? Surveying the tables, there were plenty of vendors selling prints, posters, doodles and a whole lot of comics. While some comic vendors passed for classic zine-makers with hand-stapled and photocopied pen drawings on display, others were selling publications that could have sat in any mainstream bookstore. Comics seem to be one of the bigger niches within this hodge-podge of the city’s independent arts, but it’s only one of many. This was largely attributed to the different artistic backgrounds that everyone comes from. “You’ve got folks who come out of the literary and chapbook community, folks who come out of comics and illustration, folks who come out of art books and folks who come out of cut and paste political zines,” said Valelly. Canzine’s content unsurprisingly ranges as widely in subject matter as its art does in art style. Whereas artists like Bright may focus their work on daily musings, others like zine publisher Dana Kearly explore relationships with chronic illness and horror films. Panelist Caitlin French is a self-defined painter, writer and wildcrafting witch who speaks about the loss of fertility and her father figures through her work. Guns wanted to write concert reviews because she didn’t like what she was reading in Rolling Stone. Panelist Cole Pauls, whose piece Dakwäkãda Warriors II won the 2017 Best Comic/Art Zine and Best Overall Zine awards from Broken Pencil, centres his work around the topics of pizza and Southern Tutchone language revival. All of the artists seemed to collectively agree that the overarching theme in zine culture is that there is no theme, other than a passion for expression through independent arts. This was apparent just by looking under most vendor tables, where you could see a small pile of zines, prints and comics that had been purchased throughout the day. While the people that strolled around the venue all looked like they had stepped out of different social circles, everyone seemed genuinely interested in each other’s work — punks in studded denim jackets chatted passionately with fine arts students in oversized sweaters along with the witches in floppy bonnets. Valelly characterized this collective spirit as the fair’s ethos.